The Type 2 Ka-Mi amphibious light tank was an innovative design developed by the Imperial Japanese Navy for their Special Naval Landing Forces (Japan’s equivalent to the U.S. Marines). Loosely based on the Army Type 95 Ha-Go light tank, the Ka-Mi was the Japanese Navy’s first successful amphibious tank. As such, it was an evolutionary design that used many of the Type 95 Ha-Go’s mechanical components, but with much of the riveted structure replaced with welded plates for greater watertight integrity. Twin screws and rudders were added to enable water navigation, as were detachable breathing towers for the engine air intake and for the turret. The most dramatic innovation of the Type 2 Ka-Mi was the pair of large pontoons fore and aft. Designed to improve seaworthiness and enhance reserve buoyancy, these bulky fittings temporarily changed the outline of the compact light tank into a boat the size of a King Tiger. Needed only for sea travel, these encumbrances were detached from the vehicle upon reaching land, reconfiguring the Ka-Mi back to a fully-capable light tank. Although it must have been awkward, the Ka-Mi was an unusual transformer able to act as an armored fighting vehicle on both sea and land. The Type 2 Ka-Mi represented an odd but apparently workable solution to the seaborne mobility problem, but the approach required a number of complex components which did not lend themselves to mass production. The forward pontoon, for example, was subdivided into eight separate compartments to maintain watertight integrity in case of damage. Also, by the time the Ka-Mi was ready in 1942, Japan was going over to the defensive and there was less need for the tank’s amphibious capabilities. Worse, the 37mm main gun and two 7.7mm type 97 machine guns, adequate when the Ka-Mi was designed, had become insufficient by the time it was operationally deployed. Plus, its thin armor made it vulnerable to anything of .50 cal and above: easy meat for the 75mm-armed M4 Sherman. Ultimately, only 184 units were built and the tank never played a major role in the fighting in the Pacific. Nevertheless, the Type 2 Ka-Mi did see some action: U.S. Army forces encountered a few them at Aitape and Biak during the New Guinea campaign, and in February 1944, two companies of Type 2s were among the Japanese armored units overwhelmed by the U.S. assault on Kwajalein (although it is unclear whether these actually fought or were simply wiped out in the preliminary naval bombardment). A confirmed instance of their use in combat was on the night of June 15, 1944 on Saipan when three Type 2 Ka-Mi tanks of the Ito Detachment of the 1st Yokosuka Special Naval Landing Force were part of a spoiling raid against the left flank of the landing beaches. These Saipan Type 2s had been employed as conventional armor without their pontoon gear fitted; U.S. Marine Sherman tanks and infantry bazookas destroyed all of them. They also appeared at Ormoc Bay in the Philippines after the U.S. invasion there. Again they didn’t see much action, although Ralph Zumbro in Tank Aces reports that several Ka-Mi were destroyed by Army LVT-1's off Leyte during history's only Amtank vs. Amtank action. Dragon’s initial release of the Type 2 Ka-Mi light tank back in 2011 was widely celebrated as a masterpiece of the model producer’s art; now Dragon is back again with a comprehensive, late production amphibious version of the Ka-Mi that includes its distinctive pontoons, and it is a beauty! Dragon first released the basic tank without the pontoons as the Type 2 Ka-Mi "Combat Version" a couple of years ago (Item No.6678). That kit was, despite some minor errors in the instructions and tight fitting DS tracks, a super effort which was one of Dragon’s best to date. This release is that same plastic with the addition of 110 new parts for the pontoons and turret/engine deck trunking. Construction of this "Late Production" version is the same as the original release through Step 7, the pontoons assembly. For an assessment of the parts and assembly of the basic tank, I would refer you to Russ Amott's excellent review of the Type 2 Ka-Mi "Combat Version". one captured by the U.S. The differences are minor, but you do need to decide which one you want to build so you don’t get confused as you go along. Everything fits together properly on their complex fittings - if you pay attention to the instructions. Seams are minimal, and the pontoons go together quickly. All options for this kit are "Late Production" machines, but the forward pontoon is slightly different for each of the three. The left upper deck (part K13) has a little triangular extension (with a part K12 to fill it in underneath) near where it fits in front of the glacis. This is used only for the 1944 Ormoc Bay vehicle, and must be removed for the other versions. Interestingly, there is also an unused part (K6) that would fit into this position for yet another minor variation not mentioned in the instructions. Is this a preview of an "Early Production" kit to be released in the future? Given Dragon’s usual practice of multiple variant releases, I’ll bet it is. Another option in this kit is for the Kurile Islands Ka-Mi, which has some small extra fittings (M13 and M14) on either side near the rear of the pontoon where it connects with the tank’s forward hull sides. These fittings look good if that is the version you want, but they fit into locator holes in awkward spots which must be filled-in for the Ormoc Bay or captured vehicles. Otherwise the pontoons for the three options are identical. Fit of all parts is superb, and the rivet, cut steel and weld line effects are first-rate throughout. The aft pontoon is the same for all versions. Assembly is straightforward with no problems, and the completed pontoon fits perfectly onto the rear deck of the tank. You have the option of showing the pontoons either on the tank or disconnected. If attached, parts B19 are the closed clamping devices which won’t be visible, but will help secure the pontoon to the model. If detached, open claws and their corresponding rings (M15) are provided. They are nicely done, and it is a shame that I won’t be using them when I attach the pontoons! This section also has several circular fittings (valves?) which attach on the sides below the waterline and underneath. Dragon provides these as a combination of plastic and photoetch (parts M2 and MA8) or, if you don’t want to mess with photoetch, as plastic parts (parts M4 and M6). I normally use photoetch when there is an option, but in this case the plastic looks so good there isn’t really much to choose between them. Still, it is nice to have that choice. The twin rudders which steered the Ka-Mi in the water were also attached to this pontoon. They were controlled from inside the tank by a wire pulley system which was mounted on top of the pontoon deck. The pulleys and actuators are beautifully-rendered, and wire is provided to rig the system if the pontoon is depicted in place. 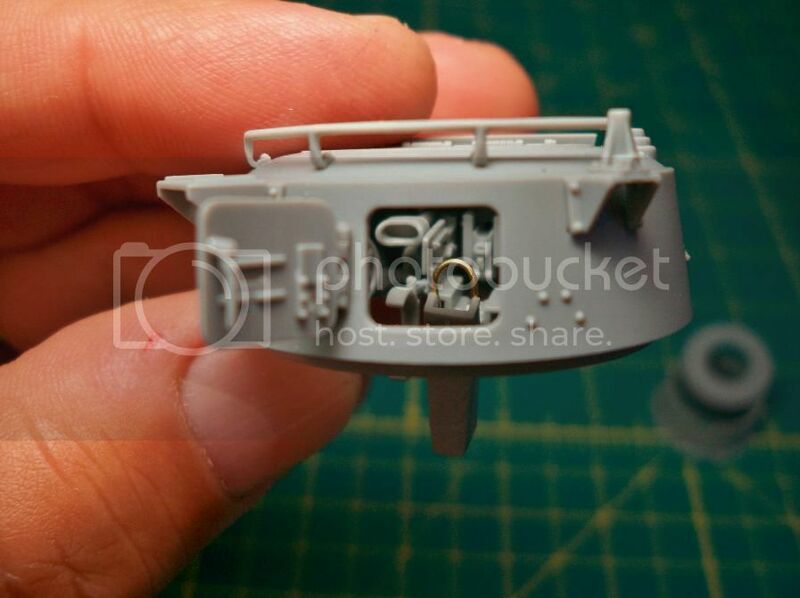 Other fittings added for this release are the vent trunks for the engine deck and turret. The engine deck intake (parts J10, J12, and J14) is reminiscent of the mushroom vents seen aboard IJN ships of the era. Surface details on these parts are excellent and the fit is perfect. An interesting detail is the machine gun mount (J19) for the top of the vent. I don’t have any specific information on this, but it seems logical that the bow machine gun, unusable when the forward pontoon was in place, would have been temporarily mounted here during beach assaults. In any case, it offers the modeler an opportunity to show off Dragon’s superb 7.7mm type 97 machine gun, which would normally be mostly hidden inside the hull. The other vent trunk, on the turret, is a little conning tower consisting of four perfectly-formed parts, and six clear styrene vision blocks. The fit is dead-on, and the hatch can be left open to show off the excellent turret interior. There is a tiny photoetch replacement part for the interior latch, but the detail molded onto the plastic part is so good that it really isn’t necessary. All machines are shown in an unspecified IJN green. This appears appropriate, as the Japanese apparently switched from navy grey to a green base color sometime in 1943. Since production of the vehicles was 82 in 1942 and 100 in 1943, the early half were probably painted in gray and the later production batch in green. Dragon’s original release of the basic Type 2 Ka-Mi "Combat Version" back in 2011 was a masterpiece, and they have now completed the circle with this comprehensive late production amphibious version. The newly-tooled pontoons and vent trunks are fully up to the standard of that first outstanding kit, making this combined 2013 release a beautiful, complete rendition of a most unusual tank. Highly recommended! Highs: Fantastic detailing on all surfaces, excellent fit throughout. Very cool subject. Lows: Minor errors in the instructions carried over from the original "Combat Version" release. As with that release, the DS tracks fit very tightly, leaving no sag. Verdict: Absolutely great kit of an unusual and interesting subject. Gino, you are correct, but sadly the software here doesn't give us enough space to write "amphibious tank," so I figured "amtrac" would get your attention. And I was right! I made some more progress on my Ka-Mi. 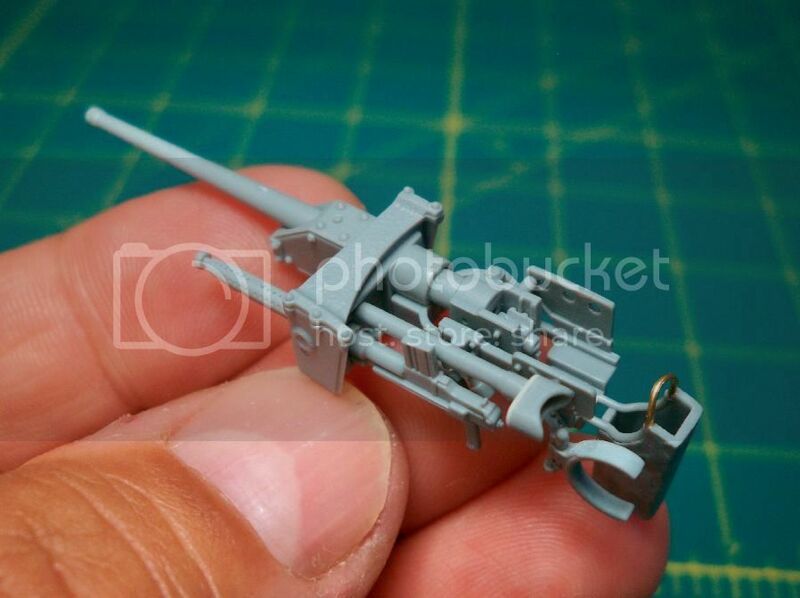 That 37mm gun assembly is a thing of beauty! 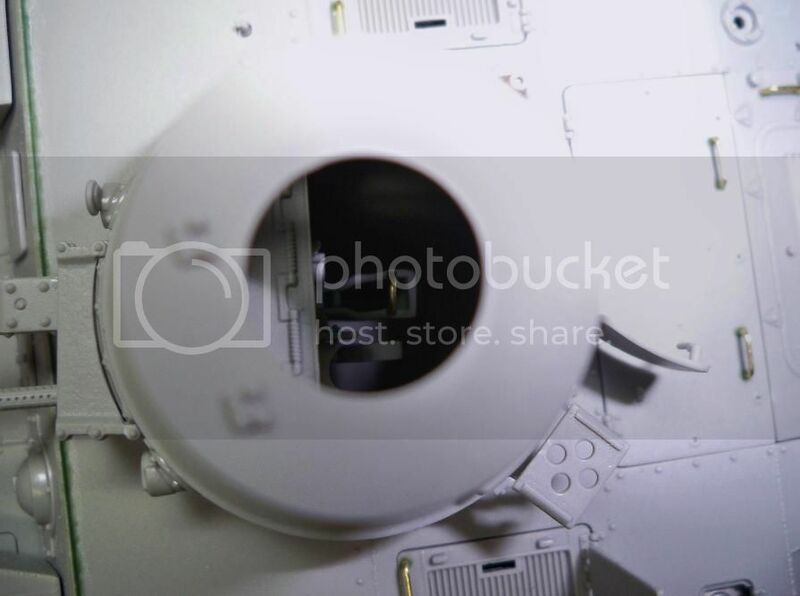 Here’s the view through the aft turret hatch: Unfortunately, all this will be difficult to see after it is installed. It looks good under extreme lighting for the picture, but once the turret is on the hull and the trunking added on top it will be pretty dark in there. The view looking down through the hatch above is already fairly dismal: Oh well, at least I’ll know it is in there! Thanks Tim for the excellent review. I've had my eye on one of these since the CH release and lo and behold last week Hobbyspace sent me an alluring email offering these up for US$30. Needless to say the kit moratorium I'd promised I'd undertake went by the wayside Still at least it sounds like it will be worth the "guilt". Regarding the tightness of the DS tracks, can these be stretched slightly by being placed in warm (not hot) water? I can't wait to see it painted! That gun is amazing. Nice review, I'll probably buy this just because the appearance is so different to any military vehicle ever produced. Does anyone do indy tracks for this tank?